Eoraptor was a saurischian ("lizard-hipped") dinosaur, a very primitive theropod, and a member of the infraorder Herrerasauria (which includes Herrerasaurus, Staurikosaurus, Saltopus, and other very early dinosaurs). 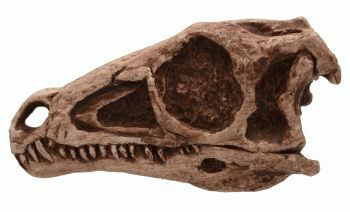 The type species is Eoraptor lunensis (named by Paul Sereno, Forster, Rogers and Monetta in 1993). 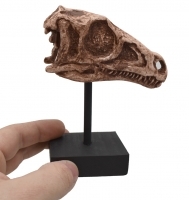 Eoraptor lived during the late Triassic period, roughly 228 million years ago. It is one of the oldest dinosaurs yet found. Eoraptor was a carnivore, a meat eater. It may also have been a scavenger. Eoraptor walked on two legs and was a relatively fast runner. Dinosaur speeds are estimated using their morphology (characteristics like leg length and estimated body mass) and fossilized trackways. Eoraptor means "dawn thief." It was first found by Ricardo Martinez in 1991 in Argentina, South America, in the Ischigualasto Basin. This area was a river valley during the late Triassic period but is a dry, eroding desert badlands today. Eoraptor was found in the same rock formation that yielded Herrerasaurus, another very early theropod. Three specimens have been found, all in the Ischigualasto Basin. Eoraptor was named by paleontologists P. Sereno, Forster, Rogers, and Monetta in 1993.